The MaxTV Clip is a convenient 2x clip-on telescopic system that attaches to eyewear and magnifies objects (for example, a TV) that are approximately 10 feet away. To use the MaxTV Clip, squeeze the clip to separate the prongs and then attach the product to the bridge of the eyewear and release the clip. 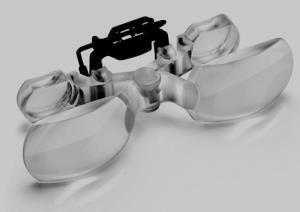 The MaxTV Clip has protective rubber covers over the prongs so the Clip won't scratch the lenses of the user's eyewear. 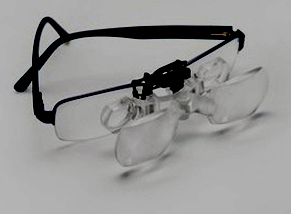 The rubber covers also prevent the MaxTV Clip from slipping off the eyewear or from moving out of alignment. In addition, the backside of the ocular lenses have a thin foam strip to avoid scratching the lenses of the eyewear. And, when magnification is not needed, or the user wants to focus on close-up text or objects, the MaxTV Clip can be flipped up and out of the way - there is no need to constantly remove and reattach it! To ensure the optimal line of sight that maximizes the user's field of view is gained, the lens assembly can be placed on 1 of 5 different vertical positions to achieve the appropriate and most suitable height. A protective, zippered case is provided to protect the MaxTV Clip when not in use.